Don & Julie Fedde both grew up locally. Julie attended La Canada schools and then John Muir High School and Pasadena City College. Don graduated from rival high school PHS, also attended PCC and then USC. In 1937, Don’s parents’ Arnold and Ellen Fedde started Fedde Furniture on the same block that it stands today. It has been family owned and operated for more than three generations. Don took over as president in 1963. Now, two of their four children Mark Fedde and Melinda Fedde Kenney, continue on the family tradition. Don and Julie raised their children in San Marino where Julie was very involved in the San Marino schools including a stint as Valentine PTA President and as San Marino High School PTSA President. She volunteered at eight of the famous grad night extravaganzas, chairing the 1984 Evening in Paris themed event. She was also active in NCL – San Marino Chapter. Recently, Julie helped put together the book, San Marino, A Centennial History for the San Marino Historic Society. Julie has had numerous commitments outside of San Marino including membership of the Pasadena Symphony Juniors and work with the Pasadena Showcase House. Also a fan of local history, Don joined the Board of the Pasadena Museum of History and helped to revitalize the museum. 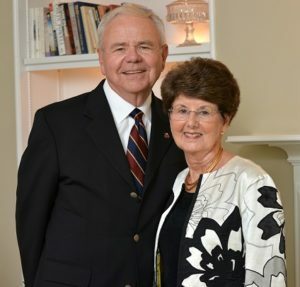 He served as Board Chair, was honored as a Contemporary History Maker in 2012 and is an Honorary Trustee. Don is also involved in the Tournament of Roses and the Fedde’s still host an annual reunion of the Queen and Court from the year he was president. Don has been a Pasadena Rotarian for over 20 years and is a member of Pasadena’s Twilight Club where he served as President in 2014. When Julie and Don’s son Mark had a disabled child, they again stepped up to help a small local nonprofit, Move A Child Higher (MACH 1), where their grandson, Taylor, participated in the therapeutic horseback riding program. In 2016, they set up an endowment at PCF to help support PCF grants to non-profits serving disabled youth.